What's a quilter to do??? Sometimes you have to make hard decisions based on the real value of the piece, the intrinsic value of the piece, the importance of heritage, and the expediency of getting the thing done. Decisions, decisions, decisions. I knew I shouldn’t have done it; it was an old quilt, with blocks made in the 30’s and 40’s, and I machine quilted it. With invisible thread. Mea culpa. The thing is, I know better. Dresden plate blocks made by one’s husband’s mother’s great-grandmother and grandmother shouldn’t be machine quilted, they should be hand quilted. The problem with this was that my husband’s mother, although a feisty woman, is eighty years old, and battling both ovarian cancer and congestive heart failure. In my heart of hearts, I think every sunrise she sees is a gift, and I didn’t think she could sit around and wait for me to hand quilt those old blocks, seeing as how the last quilt I hand quilted took me a year and a half to do. To make matters worse, I machine quilted those old blocks to a polyester batt. Mea maxima culpa. I was, at first, going to unbaste the layers she and her daughter had basted together and substitute a cotton batt; but the only stitches put in the quilt by my husband’s mother were the ones that hand quilted one old block to the batting and back, through the polyester batting, and I simply didn’t have the heart to take those stitches out. She had started quilting it before she started chemotherapy, but now her fingers are numb, and who knows? They may have been her last stitches, ever. I know, the Quilt Police are after me, and I’ll be lucky to see the next sunrise, myself. I did what I did and I’ll stand by it, because I’ve been here before. 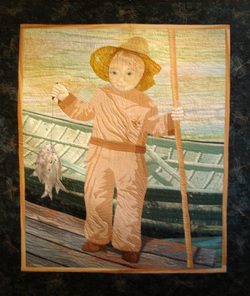 Once, several years ago, I made a quilt for my father-in-law, of him standing on the dock of Bald Eagle Lake in 1922 with his first catch of fish at age 4. It was a great quilt, with love poured into every stitch, but he never got to see it. We took photos of the quilt and sent them to him, and he knew that someone loved him enough to make him a quilt, but the quilt was exhibited in a show in September, and I never got around to sending it to him until it was too late. My husband was going to take the quilt to him on January 8, but he died two after Christmas. This time, I’m making sure. Sometimes you have to make hard choices. You have to decide whether to send a quilt to the person it was made for, or send it to a show before it gets worn or dirty. . You have to decide whether the quilt you’re making achieves the artistic heights you aspire for it, or if you should cut it up into little bits and try again. You have to decide whether to stand up for the long tradition of quilting where every point must meet and every seam must be ¼”, or whether it’s more important for your grand-daughter to have a quilt to snuggle into, however imperfect it may be before she gets too big to fit under it. A quilt is not a quilt until it’s quilted, and a giving quilt is not a quilt until it’s given.